The mysterious death of a colleague leads Adam Gold, a claims investigator, to the discovery of a treasure trove of never-before-heard songs by the world's most popular recording artist. The King of Rock 'n' Roll himself -- Elvis Presley. Gold will soon learn that there are lots of people who are willing to die -- or kill -- to get their hands on the tapes. The list will include religious fanatics, crooked cops, the mafia, and even his own employers. The Elvis fiction genre has produced some outstanding work and unearthed several formidable authors. Joining the upper echelon is Stephen G. Yanoff, whose debut novel, The Presley Plot, is a wonderful diversion from the humdrum of our often tedious lives. The plot is neatly summarised in the publisher's description above so I won't dwell too much on it except to say that lives are at stake - there are only 72 hours to solve the case - and the sinister goings on beginning in Elvis' birthplace, Tupelo, Mississippi, mean the reader is in for a rollicking, fast-paced ride in a race against time. She told them that the real danger was leakage. The fuel rods were sheathed in a coating of zirconium, and if the coating burned off, radioactive gases escaped, contaminating the water in the unit. If the water wasn’t contained, the plant could be flooded with thousands of gallons of radioactive fluid. Ideally, the containment walls would prevent such an incident. After a while, tempers began to flare. “Let there be light!” someone shouted. “Amen!” somebody added. Lo and behold the lights began to flicker, and the train lurched forward, slowly regaining momentum. Nasty little creep. He had a long black ponytail and a tomahawk tattoo on his left arm. He liked to play with knives. Annette Russo, was a tall, handsome woman, halfway between pretty and pretty darn average. A Choctaw undertaker was called a bone picker, and just as the name implied, they had the grisly task of scraping putrefied flesh from the dead. To accomplish this, they grew their fingernails long, sharpening the tips into a fine point. As fate would have it, the Presley home in East Tupelo escaped with only minor damage. Gold wasn’t sure if this was meant to be Divine Intervention, but in any case, the King’s birthplace had survived intact and it was now the centerpiece of the town’s most popular attraction, the Elvis Presley Center. Not surprisingly, Yanoff's previous life as an insurance company executive allows him to infuse the story with an authentic feel. His central protagonist, Adam Gold, as the insurance claims investigator, is well drawn as are the many other fascinating characters that inhabit this Old South mystery. The Presley Plot is baked from a neat recipe: an expressive narrative which resonates with murder, greed, crooked cops, the ‘baddest of the bad’ Russian and American mobsters and eccentric locals (and of course that guy named Elvis); a nicely constructed plotline which twists and turns at a brisk and effective pace; and the author’s keen wit. The finished product is a well packaged and wonderful mystery. Note: If you have ever wondered how Shakespeare and Chinese proverbs intertwine, or how one’s aunt could have testicles, then The Presley Plot is definitely for you! 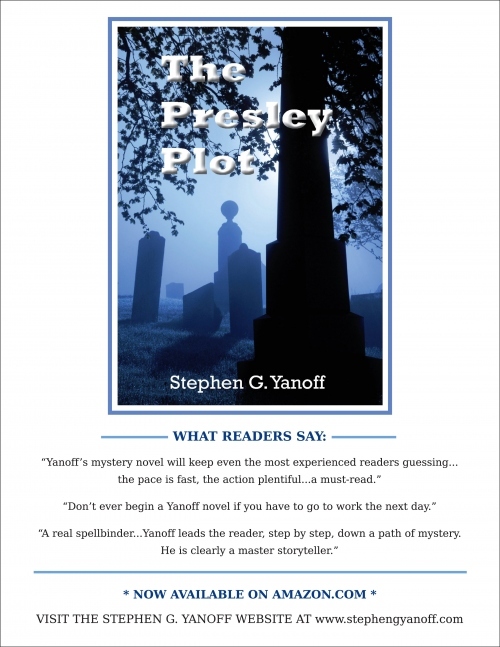 Verdict: The Presley Plot is Stephen Yanoff’s first novel and it is a great debut. Rich in colorful character and locale and an Elvis mystery that keeps you guessing - it is a real page turner and joy to read. Stephen G. Yanoff is a former insurance company executive from Long Island, New York. He worked in Manhattan for over twenty years and became an acknowledged expert in the field of high risk insurance. He is a published playwright and the winner of several prestigious playwriting contests. He has also had the privilege of serving on the board of directors of the Writers' League of Texas. He currently lives in Austin, Texas, with his wife and two daughters. When he is not writing mystery novels, he is playing Texas Hold 'Em, and winning tournaments.